This recipe is easy, delicious and packs a protein punch! For even more plant-based protein, serve over quinoa and enjoy! Dice the onion. Gently heat 2 tablespoons of olive oil in a deep sauté pan. Add vegetable broth, coconut milk, tomato paste, to pan and stir. Grate ginger and add to pan along with curry powder, turmeric, cumin, salt and dash of cayenne. Add peas and spinach to mixture. Stir and continue to cook on low heat for 5 minutes. Here is a sunshine-y recipe with fresh mango and basil. Add all ingredients to blender and mix thoroughly. This is a simple recipe for Cashew Ricotta. I used this as the base of my filling for a zucchini tart that I made over the weekend, but it can be used pretty much anywhere and can easily keep for a few days in the fridge. First, chop and sauté yellow onion in 1 tbsp olive oil and a dash of salt until translucent. Allow to cool. Next, add onion, cashews, olive oil, garlic and water to food processor and pulse to mix. Add lemon juice, cayenne and salt and adjusting seasonings to taste and pulsing to mix. To join in on the sweet fun, I made these Purple Power Donuts. The main base of this recipe is purple corn flour. I stumbled across this flour in the ethnic section of my grocery store and loved its pretty purple color. Aside from a nice appearance, that purple color signifies the presence of anthocyanin–a major source of antioxidants. Pair that with some antioxidant blueberries and you have a powerful combo! In addition to the fabulous antioxidants the recipe offers, it’s also a good source of fiber. Holla! 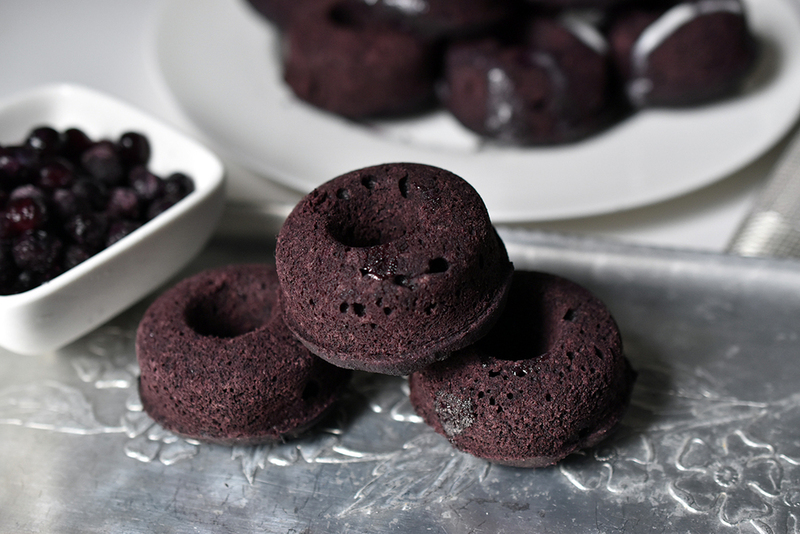 The result is a delicious, velvety, satisfying donut that hits all the right notes. First, preheat your oven to 350 degrees Fahrenheit. In a medium sized bowl, combine your dry ingredients (purple corn flour, oat flour, salt and baking powder) with a whisk. In a separate bowl, add 1 cup of almond milk with 1 tsp of apple cider vinegar and set aside. Meanwhile melt, your coconut oil and combine with vanilla and sugar. Add the almond milk mixture and mix thoroughly. Add wet ingredients to dry in about 2 rounds while mixing in between. Lastly, gently fold in the blueberries. If you are using a mini donut pan, make sure you spray it with nonstick spray or lightly oil it to make the donuts easier to remove once they’re done baking. Spoon dough into the donut shapes leaving a little room at the top for them to rise. If you don’t have a donut pan, you can still create the donut shape – I found this awesome kitchen hack that allows you to easily accomplish the same thing. What a great idea! If you’re someone who likes sweet and salty desserts, these are going to be right up your alley. They’re incredibly easy to make and are a simple gluten-free treat that can be whipped up in no time. Quinoa can be purchased puffed, but it’s just as easy to do it at home and it has a wonderful crunchy texture that makes this recipe extra satisfying. First, set up a deep pot (I used a dutch oven) to puff the quinoa. Turn the heat to medium-medium high and allow the pot to get hot. Add a few bits of quinoa to the pot to test – if they start popping, go ahead and add the rest, if not, give it a little more time. Here is a simple video demonstrating the technique. Once the quinoa has popped, remove from heat and allow to cool slightly. Meanwhile, melt 1/4 cup of coconut oil in a medium sized bowl using your preferred method (I kept it simple and used a microwave for this step). Next, add 1 oz of semi sweet baker’s chocolate and stir until chocolate is melted (you may need to add more heat). Once the chocolate has melted into the coconut oil, stir in 1/2 tsp vanilla and 1/4 cup maple syrup. Add puffed quinoa, the chocolate mixture, 1/4 cup peanut butter and 1/4 tsp salt to a food processor. Blend until mixture has a fairly consistent texture and all of the peanut butter has combined evenly. Using an ice cream scoop, dough shape into balls and roll in crushed pistachios to create coating. Refrigerate for at least 30 minutes before serving. Winter isn’t quite over yet, which means this White Carrot and Peanut Soup is just what the doctor ordered. Slice the onion and roughly mince the garlic cloves. Gently heat olive oil in a large soup pan. Add the onion and garlic pieces along with a dash of salt. Allow to sweat until the onion becomes translucent. Meanwhile, peel and roughly chop the carrots. Add to soup pan and cook for about 10 minutes or until carrots begin to soften. Next, add onion, garlic, and carrot mixture to a blender along with 1/2 cup peanut butter and half of the vegetable broth. Blend on high until smooth. Add mixture back to pan and combine with the rest of the veggie broth, grated ginger, maple syrup, salt and cayenne. Mix thoroughly. This soup is delicious served with chopped peanuts, cilantro, and/or red pepper flakes. The first time I made cauliflower wings, I chopped the florets into smaller pieces and found that they didn’t have a ton of texture. This time, I chopped them into large pieces so they kept a bit more bite and had more of a “drumstick” feel. Mmmm so good! Preheat oven to 425 degrees Fahrenheit. Chop cauliflower into large “drumstick”-sized pieces. In a medium bowl, whisk together hot sauce, vegetable broth, water, flours, potato starch, olive oil, maple syrup and spices. Mix until well-combined. Dunk cauliflower into the sauce and place on a greased half sheet tray. Roast for 35 minutes.